Today the Senate will make history, swearing in a record-breaking 20 female senators -- four Republicans and 16 Democrats -- in office. 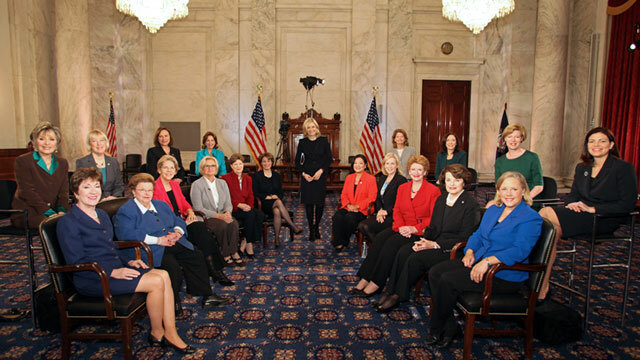 As the 113th Congress is sworn in today on Capitol Hill, ABC "World News" anchor Diane Sawyer has an exclusive joint interview with the historic class of female senators. "I can't tell you the joy that I feel in my heart to look at these 20 gifted and talented women from two different parties, different zip codes to fill this room," Sen. Barbara Mikulksi, D-Md., said while surrounded by the group of women senators. "In all of American history only 16 women had served. Now there are 20 of us." Senator-elect Deb Fischer, R-Neb., today becomes the first women to be elected as a senator in Nebraska. "It was an historic election," Fischer said, "But what was really fun about it were the number of mothers and fathers who brought their daughters up to me during the campaign and said, "Can we get a picture? Can we get a picture?' Because people realize it and -- things do change, things do change." The women senators all agree that women will be getting things done in this new Congress, a sign of optimism felt for the new Congress, after the bruising battles of the 112th Congress. "We're in force and we're in leadership positions, but it's not just the position that we hold. I can tell you this is a can-do crowd," Mikulski said of both Democrats and Republican senators in the room. "We are today ready to be a force in American politics." And while the number of women in the Senate today makes history, many of the women agreed that they want to keep fighting to boost those numbers. Sen. Barbara Boxer, D-Calif., said that women are still "underrepresented" in the Senate. "I think that until we get to 50, we still have to fight because it's still a problem," Boxer said. "I think this class as you look around, Republicans and Democrats. ... I think that because of this new class and the caliber of the people coming and the quality of the people coming, I think that hopefully in my lifetime -- and I really do hope and pray this is the case -- we will see 50 percent. " The cooperation does not make them a "sorority," Sen. Dianne Feinstein, D-Calif., says. There are real differences in ideology and personality and they don't want their gender to define them as senators. "What I find is with all due deference to our male colleagues, that women's styles tend to be more collaborative," Sen. Susan Collins, R-Maine, said. Sen. Claire McCaskill, D-Mo., said by nature women are "less confrontational." Sen-elect Mazie Hirono, D-Hawaii, says that women are "problem solvers." "I think there's just a lot of collaboration between the women senators and... advice and really standing up for each other that you don't always see with the men," she said. "We're less on testosterone," Feinstein said. "We don't have that need to always be confrontational. And I think we're problem solvers, and I think that's what this country needs." "Maybe it is the testosterone that you speak to, Dianne, or the ego that is attached there. But I look at what I have been asked to do by the people of Alaska, and it's pretty serious stuff. And it's not the title, but it's the responsibility that comes with the service that I think makes a difference," Murkowski said. In the combative halls of Congress, McCaskill argued that for all these reasons women can get beyond "team mentality" of Democrats vs. Republicans and work towards a better goal. "Having us in the room... not only do we want to work in a bipartisan way, we do it," McCaskill said. "We actually work together, Republicans and Democrats, and women- try to look at solving the problem rather than just going political points." But the women agree that just because their natural tendencies lean toward problem solving, camaraderie and compromise it does not mean they don't fight for what they believe in, which at times can be markedly different from their female counterpart on the other side of the aisle. "That doesn't mean that we think alike, and it doesn't mean that we don't span the ideological spectrum," Collins said. "I always push back the idea that there are women's issues. Because every issue from war to taxes to education affect women in this country. And that's why the point of having women be represented on all committees and leading many of them is so important." One of those ideological differences that often divides the two parties, and oftentimes women as well, is the issue of reproductive rights. Last year the issue took a center stage in the 2012 presidential campaign as well as in races across the country during the congressional elections as a highly polarized and emotionally charged topic. The senators showed there is disagreement among them on abortion, reproductive health decisions and even disagreement as to what leadership role women and Congress should play in the debates ahead. "I'm pro-choice," Collins said. "But I think those issues should be settled and should not be the main focus of debate. To me those issues, Roe v. Wade, is settled law and I don't know why we would want to keep bringing those issues up. I think we should be focusing like a laser on job creation, the economy, health care, education, foreign policy, national security. Those issues to me are settled." Sen-elect Elizabeth Warren, D-Mass., disagreed, saying Republicans put those issues onto the Congressional radar screen. "I don't think they are entirely settled," Warren said, "I have to say I was really shocked that those are powerful issues in 2012. I would like to think those things are settled. But they were forced forward as issues by people who thought that women should not have that kind of access. And boy, if that's the case, then we better stand up and we better speak out." Can Women Fix Washington's Dysfunction? The 112th Congress may be best known for long-drawn out fights, fierce partisanship and little to show legislatively for the year. The senators argue, at the dawn of a new Congress, that having more women in leadership positions and in the ranks as members will help improve the outlook for a more productive year. Sen. Maria Cantwell, D-Wash., says that women "leave their ego at the door and "more natural consensus builders." She said because of those traits women should be elected into more positions in Congress. "If the major issue of our era right now is the stalemate of Congress, then the message to the American people should be elect more consensus builders to get the job done," Cantwell said. Sen. Kirsten Gillibrand, D-N.Y., said that if Washington is ever going to be fixed she believes "it's women who are going to lead the way." The senator says she's spoken to President Obama about this very issue, mentioning to the president that the women have a habit of meeting regularly on a bipartisan basis for dinner. The president, she said, plans on hosting the women of the Senate at the White House soon. "When I saw President Obama a few weeks ago I told him about our quarterly dinners and I said, 'Mr. President, if you want to see bipartisanship in Washington invited the women senators to help you get it done.' And he loved the idea and he plans to invite us to the White House." Among the senators there was unanimity in predicting, and hoping, that there will be a female president soon, perhaps as early as 2016. Sen. Patty Murray, D-Wash., said here too there is a key difference between how men and women express their personal and political ambitions. "I think the thing is, is that every man wakes up in the morning and looks in the mirror and says, 'I could be president.' I think every woman looks in the mirror and says, 'What can I get done for my country today?' "
Feinstein jokingly corrected her noting that a few times she's toyed with the idea in the midst of a particularly bad episode of Washington gridlock. "Well, you may think it from time to time," Feinstein said smiling at the prospect. "Usually when you're very frustrated you think... 'If I were president I could get this done.'" Sen. Kelly Ayotte, R-N.H., shared a story about her 8-year-old daughter, Kate, who came home one day and told her mother that she didn't want her to run for president because she herself wanted to be the first female president. "Well she better call Hillary [Clinton]," Boxer quipped of their former colleague in the Senate, widely believed to have a shot at the White House should she run in 2016. "Did you break the news to her we're not waiting that long?" McCaskill asked with a laugh. Ayotte smiling said she didn't want to break the news to her daughter that there potentially could be a female president before her daughter is of age. She said she told her: "Listen, your mom's going to campaign across the country for you."